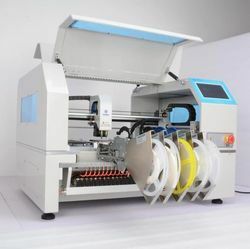 We are engaged in offering a wide array of Advance Smt LED Pick and Place Machine. Offered range of product is known for its precise quality. These machines are assembled from optimum quality components under the guidance of skilled and experienced professionals. Offered array of product is highly demanded in the market. Moreover, we assure to our valued clients to provide a quality tested range that can be delivered from our end at a leading market price. Support components: LED, 0402-5050, SOP, OFN etc. Model: CHMT36VA System Specially Design with Vision Based Pick Place to achieve more accuracy and ensure for correct Placements on Large Size of PCB/SMT/LED from Small to Max Size of Components and PCB Size. Bottom Camera Check each components before placements, it can check correct types ofcomponents, correct angle, correct direction, flip components and wrong pick Up, Missed components. Vision system sending inspected data and feedback to Programming processor, Programming Processor give optimised command to machine get the correct and 100% ensured Placements. Specially Design with Vision Based Pick Place to achieve more accuracy and ensure for correct Placements on Large Size of PCB/SMT/LED from Small to Max Size of Components and PCB Size. Bottom Camera Check each components before placements, it can check correct types of components, correct angle, correct direction, flip components and wrong pick Up, Missed components. Support components: 0201-0402-5050, SOP, QFN, BGA etc. Support components: 0402-5050, SOP, QFN,BGA etc. 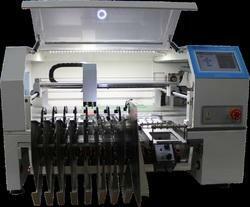 We are one of the trusted names to offer Automatic SMT Pick and Place Machine for our valued clients. With the use of advanced control system for their high speed operation, these are widely popular for effective working in mounting of PCB. Offered machines are widely used in various industries. Moreover, offered range of machines are highly appreciated and demanded by our clients. Customers can avail these products at leading price from us in the market. Can be installed 2 nozzles, the head can be easily exchanged, it can Mount the micro chip element and PBC at the same time. With the vacuum test which can subsidize material automatically, it Will get another mounting element if the element is not in the right Place, sending it to auto pulling area Auto-Test for lack of materials, remind by the ring, don’t need to Restart if you put more material, then it can continue to mount. 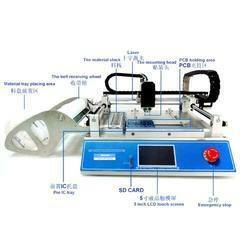 The material supplying machine is invented solely without any Payment. The nylon tray for material can separate, collect automatically, Design with patent, very reliable. Easy to be transferred, don’t need some other equipment or heavy Object, moreover it is self. Simple Chinese operating system, one can master it within half an Hour with experience of using computer. Solely invented laser cross coordinating function to place Precisely, programming is much Clear and simpler; can visually slightly move each element online Can configure the whole element offset, speed of whole element mounting, each element mounting speed, the position of the Beginning and the end, supporting break and paste. In the case like there is no PBC documents of the board is simple. The program on the machine can be combined randomly, very Easy to handle. Consuming is 200 W, Standby power is less than 80 W Multiple protection, no logistics cost, we can come to your place to Debug it and train you, the machine is warranted for 1 year. The main parts are all imported, the best material is high effective, Stable to build a strong foundation Export package is standard, the inner is Mold pearl cotton, the outer is Strengthened Fumigation wooden boxes making sure the goods can reach the destination safely. Brand Charmhigh Technology Co. Ltd.
We are one of the prominent names to offer a wide array of SMT Pick and Place Machine that are highly appreciated and demanded by our clients. Offered spectrum of machine is manufactured from optimum grade quality fabrication material and advance methods of production under the assistance of highly experienced professionals. These machines are strictly designed as per the predefined quality control measures that are why ensuring high quality. 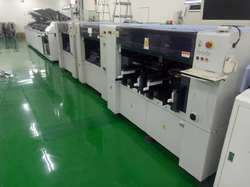 Specially Design for Large Size of PCB/SMT/LED from Small to Max Size of Components and PCB Size. 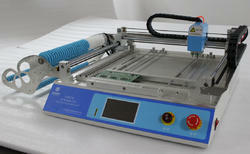 We are engaged in offering a wide array of Advanced SMT LED Pick and Place Machine-CHMT48VA. Offered range of product is known for its precise quality. These machines are assembled from optimum quality components under the guidance of skilled and experienced professionals. Offered array of product is highly demanded in the market. Moreover, we assure to our valued clients to provide a quality tested range that can be delivered from our end at a leading market price. Model: CHMT48VA System Specially Design with Vision Based Pick & Place to achieve more accuracy and ensure for correct Placements on Large Size of PCB/SMT/LED from Small to Max Size of Components and PCB Size. Specially Design with Vision Based Pick & Place to achieve more accuracy and ensure for correct Placements on Large Size of PCB/SMT/LED from Small to Max Size of Components and PCB Size. 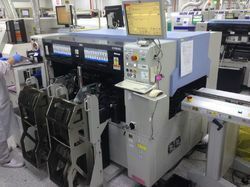 SMT (surface mount technology) component placement systems, commonly called pick-and-place machines or P P Machine, Yamaha YV100-x is robotic machines for 1200mmwhich are used to place surface-mount devices (SMDs) onto a printed circuit board (PCB). They are used for high speed, high precision placing of broad range of electronic components, like capacitors, resistors, integrated circuits onto the PCBs which are in turn used in computers, consumer electronics as well as industrial, medical, automotive, military and telecommunications equipment. Support components: 1.2 m LED strip, 0402~5050, SOP, QFN etc. 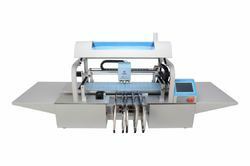 Looking for LED Pick and Place Machine manufacturer ?